We think that it is fundamental for feminisms to be incorporated into our educational practices, transversally, and actively promote the type of common learning that undermines hegemonic constructions. 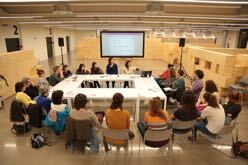 Given the interest we have noted among many of the teachers we have dealt with, we propose forming a solid group comprising people interested in education to debate, reflect upon and carry out research on feminisms and pedagogy. The goal is to share experiences, bring our heads together, men and women alike, to create transferable training tools and make for a common framework for collective debate.